Download "The Americans With Disabilities Act What Persons With Fibromyalgia Need to Know"
1 The Americans With Disabilities Act What Persons With Fibromyalgia Need to Know [Reprinted from Fibromyalgia Frontiers, January/February 1999] by Alison S. Levy, M.S. If you are a person with fibromyalgia syndrome (FMS), you know how its affects can influence your ability to maintain steady employment. The Americans with Disabilities Act (ADA) is a civil rights law passed in 1990 designed to level the playing field for people with disabilities and to ensure equal participation in our society. 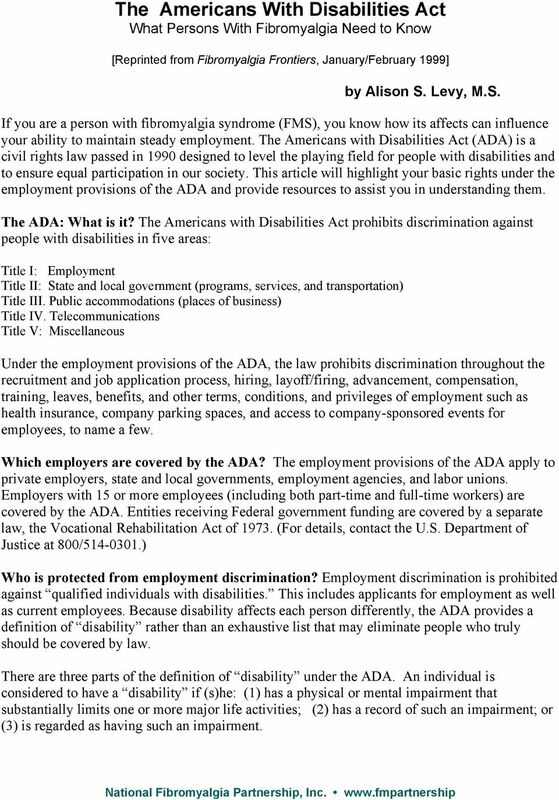 This article will highlight your basic rights under the employment provisions of the ADA and provide resources to assist you in understanding them. The ADA: What is it? The Americans with Disabilities Act prohibits discrimination against people with disabilities in five areas: Title I: Employment Title II: State and local government (programs, services, and transportation) Title III. Public accommodations (places of business) Title IV. Telecommunications Title V: Miscellaneous Under the employment provisions of the ADA, the law prohibits discrimination throughout the recruitment and job application process, hiring, layoff/firing, advancement, compensation, training, leaves, benefits, and other terms, conditions, and privileges of employment such as health insurance, company parking spaces, and access to company-sponsored events for employees, to name a few. 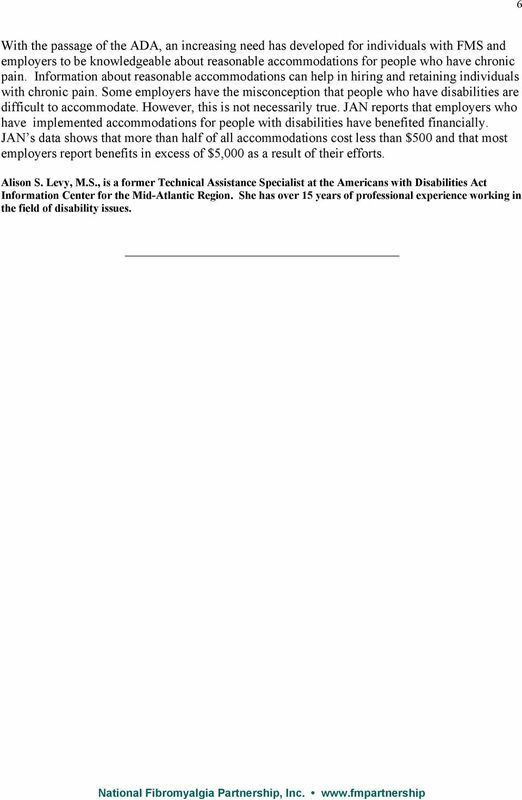 Which employers are covered by the ADA? The employment provisions of the ADA apply to private employers, state and local governments, employment agencies, and labor unions. Employers with 15 or more employees (including both part-time and full-time workers) are covered by the ADA. Entities receiving Federal government funding are covered by a separate law, the Vocational Rehabilitation Act of (For details, contact the U.S. Department of Justice at 800/ ) Who is protected from employment discrimination? 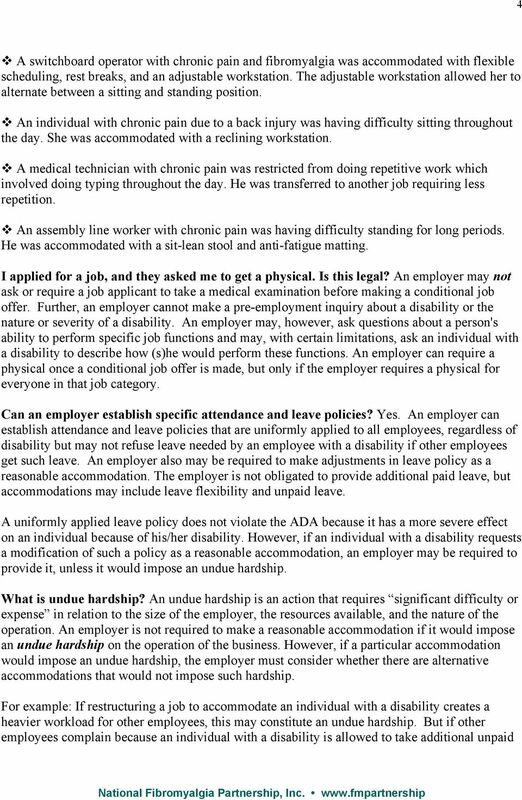 Employment discrimination is prohibited against qualified individuals with disabilities. This includes applicants for employment as well as current employees. Because disability affects each person differently, the ADA provides a definition of disability rather than an exhaustive list that may eliminate people who truly should be covered by law. There are three parts of the definition of disability under the ADA. An individual is considered to have a disability if (s)he: (1) has a physical or mental impairment that substantially limits one or more major life activities; (2) has a record of such an impairment; or (3) is regarded as having such an impairment. 3 3 participate in the interviewing process. Otherwise, you could wait and disclose your FMS after you receive a job offer or when you have determined you need an accommodation. How can I inform my employer about my FMS? There are several steps that you may want to take prior to disclosing your disability and requesting a reasonable accommodation: Prepare a brief, functional description of what fibromyalgia syndrome is and how it relates to your work. Try to focus on what you can do more than what you cannot do as a result of FMS. Develop a short list of reasonable accommodations that will enable you to complete the essential functions of your job. 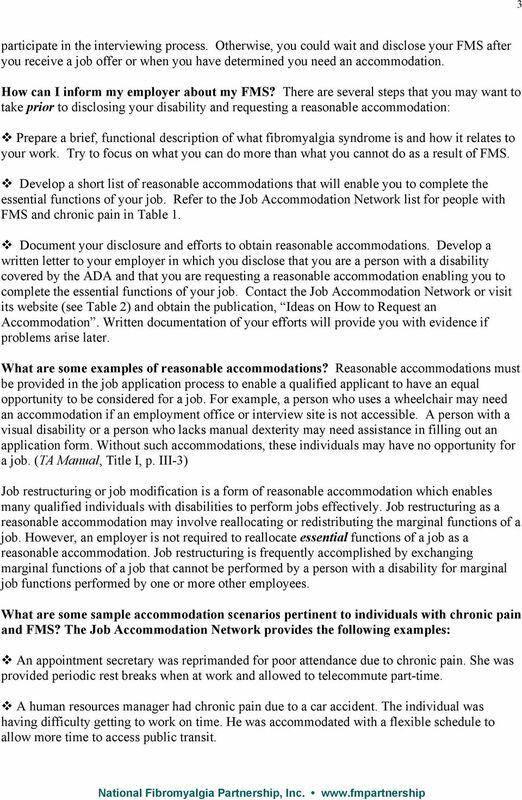 Refer to the Job Accommodation Network list for people with FMS and chronic pain in Table 1. Document your disclosure and efforts to obtain reasonable accommodations. Develop a written letter to your employer in which you disclose that you are a person with a disability covered by the ADA and that you are requesting a reasonable accommodation enabling you to complete the essential functions of your job. Contact the Job Accommodation Network or visit its website (see Table 2) and obtain the publication, Ideas on How to Request an Accommodation. Written documentation of your efforts will provide you with evidence if problems arise later. 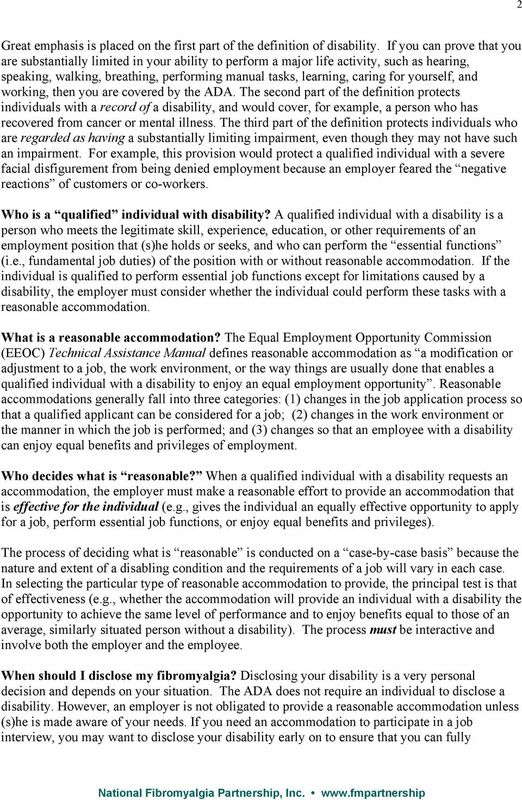 What are some examples of reasonable accommodations? Reasonable accommodations must be provided in the job application process to enable a qualified applicant to have an equal opportunity to be considered for a job. For example, a person who uses a wheelchair may need an accommodation if an employment office or interview site is not accessible. A person with a visual disability or a person who lacks manual dexterity may need assistance in filling out an application form. Without such accommodations, these individuals may have no opportunity for a job. (TA Manual, Title I, p. III-3) Job restructuring or job modification is a form of reasonable accommodation which enables many qualified individuals with disabilities to perform jobs effectively. Job restructuring as a reasonable accommodation may involve reallocating or redistributing the marginal functions of a job. However, an employer is not required to reallocate essential functions of a job as a reasonable accommodation. Job restructuring is frequently accomplished by exchanging marginal functions of a job that cannot be performed by a person with a disability for marginal job functions performed by one or more other employees. What are some sample accommodation scenarios pertinent to individuals with chronic pain and FMS? The Job Accommodation Network provides the following examples: An appointment secretary was reprimanded for poor attendance due to chronic pain. She was provided periodic rest breaks when at work and allowed to telecommute part-time. A human resources manager had chronic pain due to a car accident. The individual was having difficulty getting to work on time. He was accommodated with a flexible schedule to allow more time to access public transit. 5 5 leave or to have a special flexible work schedule as a reasonable accommodation, such complaints or other negative reactions would not constitute an undue hardship. Are there tax deductions or credits for businesses? Any business may take a full tax deduction, up to $15,000 per year, for expenses incurred while removing specified architectural or transportation barriers (see Section 190 of the Internal Revenue Code). Tax credits are also available under the Targeted Jobs Tax Credit Program (TJTCP) for employers who hire individuals with disabilities referred by state or local vocational rehabilitation agencies, State Commissions on the Blind, and the U.S. Department of Veteran s Affairs and are certified by a State Employment Service. The TJTCP program promotes the hiring of several disadvantaged groups including people with disabilities. Under this program, a tax credit may be taken for 40% of the first $6000 of an employee s firstyear salary. The TJTCP is reauthorized each year by Congress. What if I m discriminated against? The ADA does not allow an individual with a discrimination concern to go directly to court. Instead, it requires that the aggrieved employee exhaust administrative remedies before filing a civil action in court. This means that an employee s first step in challenging an unlawful employment practice is to file a charge of discrimination with the U.S. 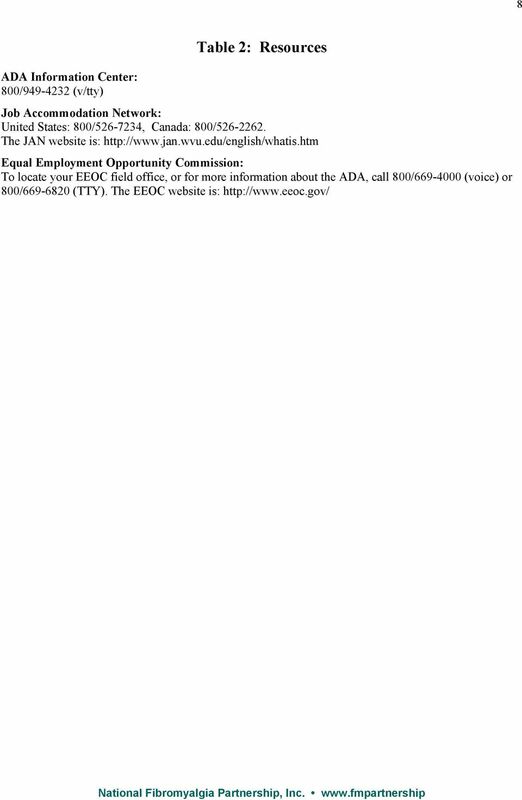 Equal Employment Opportunity Commission (EEOC) or with a State or local fair employment practices agency (FEP) within 180 days after the last act of discrimination. What resources can help me? 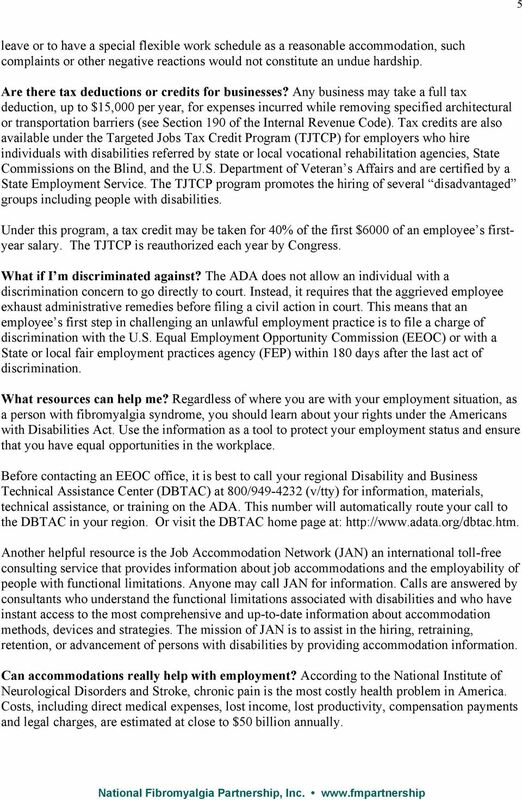 Regardless of where you are with your employment situation, as a person with fibromyalgia syndrome, you should learn about your rights under the Americans with Disabilities Act. Use the information as a tool to protect your employment status and ensure that you have equal opportunities in the workplace. Before contacting an EEOC office, it is best to call your regional Disability and Business Technical Assistance Center (DBTAC) at 800/ (v/tty) for information, materials, technical assistance, or training on the ADA. This number will automatically route your call to the DBTAC in your region. Or visit the DBTAC home page at: Another helpful resource is the Job Accommodation Network (JAN) an international toll-free consulting service that provides information about job accommodations and the employability of people with functional limitations. Anyone may call JAN for information. Calls are answered by consultants who understand the functional limitations associated with disabilities and who have instant access to the most comprehensive and up-to-date information about accommodation methods, devices and strategies. The mission of JAN is to assist in the hiring, retraining, retention, or advancement of persons with disabilities by providing accommodation information. Can accommodations really help with employment? According to the National Institute of Neurological Disorders and Stroke, chronic pain is the most costly health problem in America. Costs, including direct medical expenses, lost income, lost productivity, compensation payments and legal charges, are estimated at close to $50 billion annually. 6 6 With the passage of the ADA, an increasing need has developed for individuals with FMS and employers to be knowledgeable about reasonable accommodations for people who have chronic pain. Information about reasonable accommodations can help in hiring and retaining individuals with chronic pain. Some employers have the misconception that people who have disabilities are difficult to accommodate. However, this is not necessarily true. JAN reports that employers who have implemented accommodations for people with disabilities have benefited financially. JAN s data shows that more than half of all accommodations cost less than $500 and that most employers report benefits in excess of $5,000 as a result of their efforts. Alison S. Levy, M.S., is a former Technical Assistance Specialist at the Americans with Disabilities Act Information Center for the Mid-Atlantic Region. She has over 15 years of professional experience working in the field of disability issues. The American Disabilities Act & People with Cancer What is the Americans With Disabilities Act? The Americans With Disabilities Act of 1990 (ADA) gives civil rights protections to people with disabilities. EMPLOYMENT. What federal and state laws protect me at my job site? Alaska Human Rights Law Article 05. GENERAL PROVISIONS Sec Definitions. 5.17 REASONABLE ACCOMMODATION FOR QUALIFIED STUDENTS WITH DISABILITIES POLICY I.
Accommodation and Compliance Series Job Coaching in the Workplace Preface The Job Accommodation Network (JAN) is a service of the Office of Disability Employment Policy of the U.S. Department of Labor. 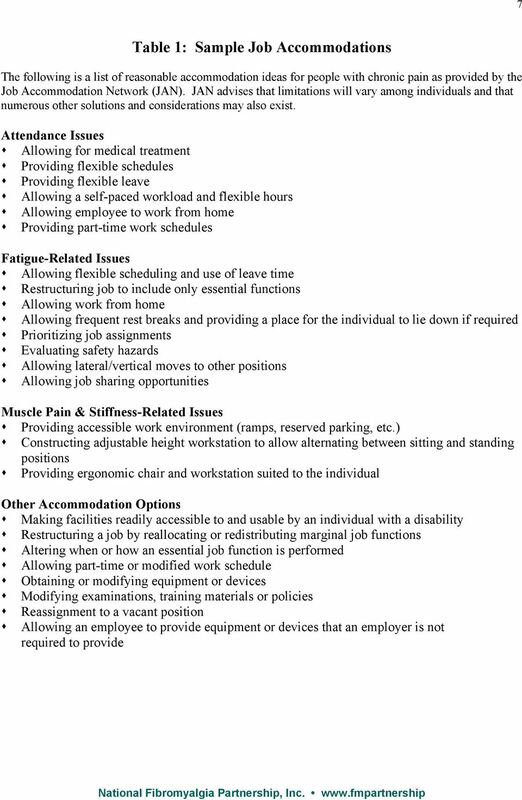 Ergonomics and Reasonable Accommodations Under the Americans With Disabilities Act. Part One of a Four Part Series. Ann F. Kiernan, Esq.